Please Note: This title is currently out of stock. From Academy Award®-winning filmmaker Hayao Miyazaki (Best Animated Feature, Spirited Away, 2002) comes a spellbinding movie beyond compare. Experience "perhaps the greatest animated film the cinema has ever seen" (David Ehrlich, Film.com) on Blu ray. Jiro dreams of flying and designing beautiful airplanes, inspired by the famous Italian aeronautical designer Caproni. Nearsighted and unable to be a pilot, he becomes one of the world’s most accomplished airplane designers, experiencing key historical events in an epic tale of love, perseverance, and the challenges of living and making choices in a turbulent world. Bring home the film that has dazzled fans and critics around the globe. 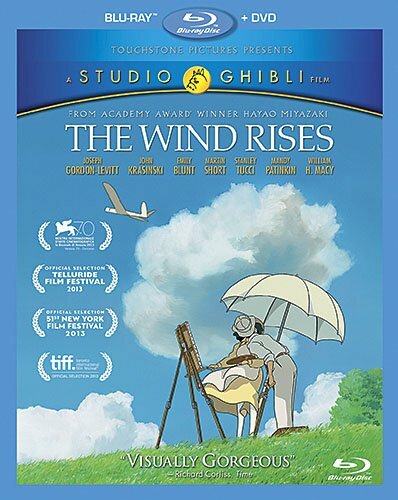 Bursting off the screen with spectacular picture and sound and featuring fascinating bonus material, Miyazaki’s masterpiece, The Wind Rises, is breathtaking on Blu-ray!